Content last revised November 29, 2018. This entry was posted in NYSLRS Retirees, Retirees and tagged CAFR, Comprehensive Annual Financial Report, Economic Impact of Retirees, New York State & Local Retirement System, NYSLRS Retirees, Retirees Contribute, Retirees Create Jobs, retirees pay taxes, retirees spending, Retirees Stay in New York, retirees support our economy on November 29, 2018 by NYSLRS. Before they leave the workforce, NYSLRS retirees build careers based — at least in part — on serving the people of New York. They are police officers, firefighters and nurses. They are the countless civil servants working each day to keep government services functioning. Their contributions don’t end with retirement. 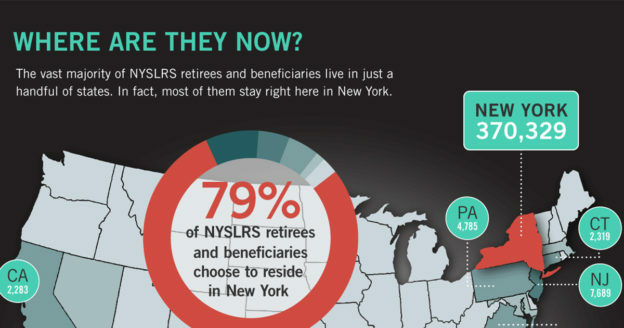 In fact, NYSLRS retirees and their pensions contribute significantly to the communities where they live. 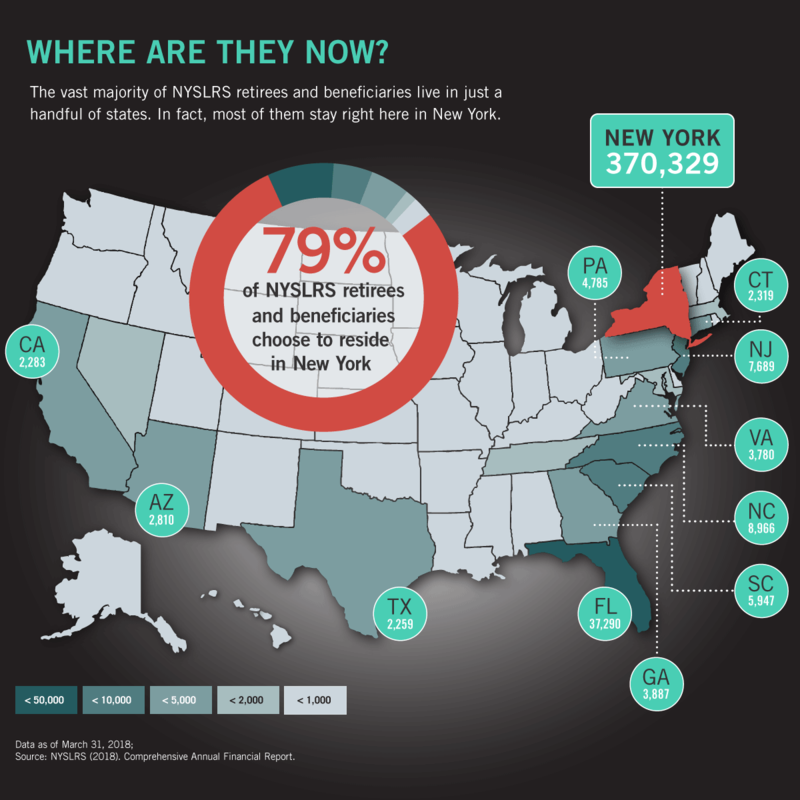 Seventy-eight percent of NYSLRS retirees and their beneficiaries (355,028 as of March 2017) stay right here in New York. They live throughout the state — from Long Island to the North Country, from the Capital District to Western New York and down to the Southern Tier. Altogether, they’re 1.8 percent of our state’s population, but in some areas, they account for more than 5 percent of the residents. Property taxes. In 2016, retirees paid $1.7 billion in real property taxes. That’s 3.2 percent of the total collected for the entire state. State and local sales taxes. NYSLRS retirees paid an estimated $618 million in state and local sales tax in 2016. Job creators. Some retirees do go on to start small businesses as a second act. 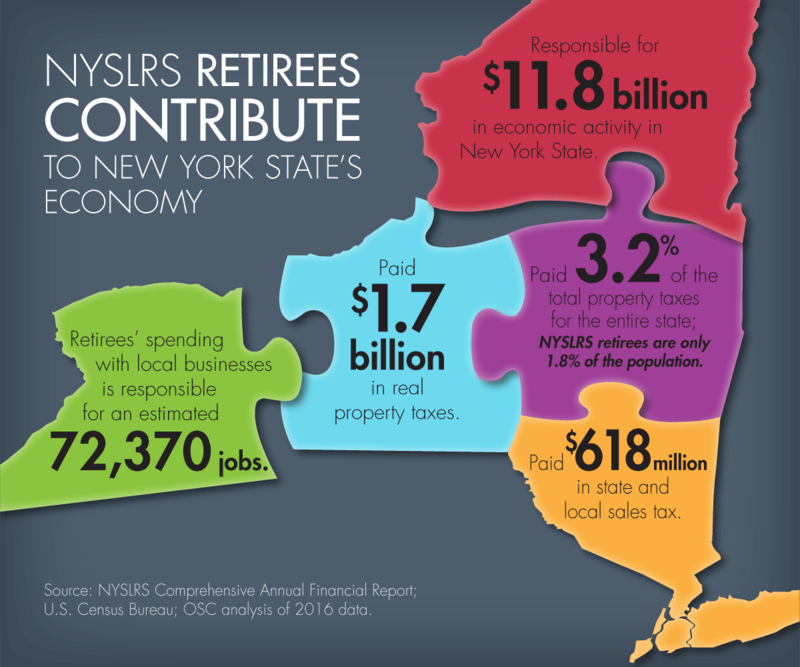 However, all NYSLRS retirees spend at least some of their income to the benefit of local businesses, and they are responsible for an estimated 72,370 jobs as a result. Remember: 75 percent of the pension benefits that make all of this possible comes from the investment earnings of the Common Retirement Fund (CRF), not from taxpayers. Are these statistics impressive? Yes. Surprising? They shouldn’t be. According to research from the National Institute on Retirement Security (NIRS), defined benefit pensions, like those provided by NYSLRS, are responsible for substantial economic gains throughout the U.S. — an incredible $1.2 trillion in total economic output nationwide. Pensions give retirees a stable source of income, and, in return, retirees support our national and local economies with jobs, incomes, and tax revenue. Content last revised January 31, 2018. This entry was posted in General News and tagged beneficiaries, Economic Impact of Retirees, local economy, New York State & Local Retirement System, New York State Common Retirement Fund, NYSLRS Retirees, One of America's Largest Pension Systems, Pension System, retireees, retirees and taxes, Retirees Contribute, retirees support our economy, retirement on January 31, 2018 by NYSLRS.